August 2, 2014 - Make sure you like EcoJoes on Facebook to stay updated on green ways to save money and help the environment. Just click the "like" button below. Muchas gracias! Shaquack! Violently tear basil leaves from the plant they’ve called home their entire life. Step 3: Combine into a healthy snack! Slice up the tomato. 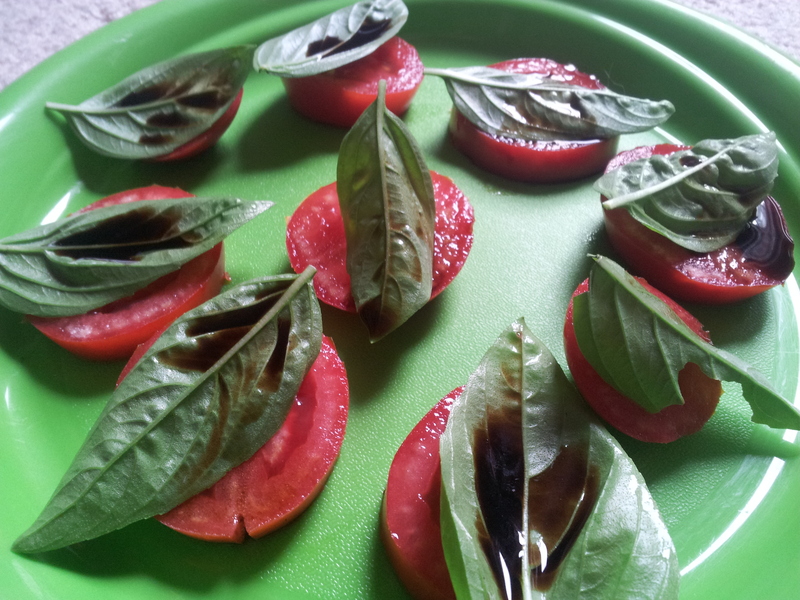 Add basil leaves to the tomato slices. Optionally, pour a lil’ balsamic vinegar on them bad boys. Bam, a fast, easy, healthy way to make tomato basil bruschetta straight from the garden! Pro Step: Add some fresh mozarella chunks. This really completes the ensemble, although it might be just a smidge less healthy than cheeseless tomato basil bruschetta. 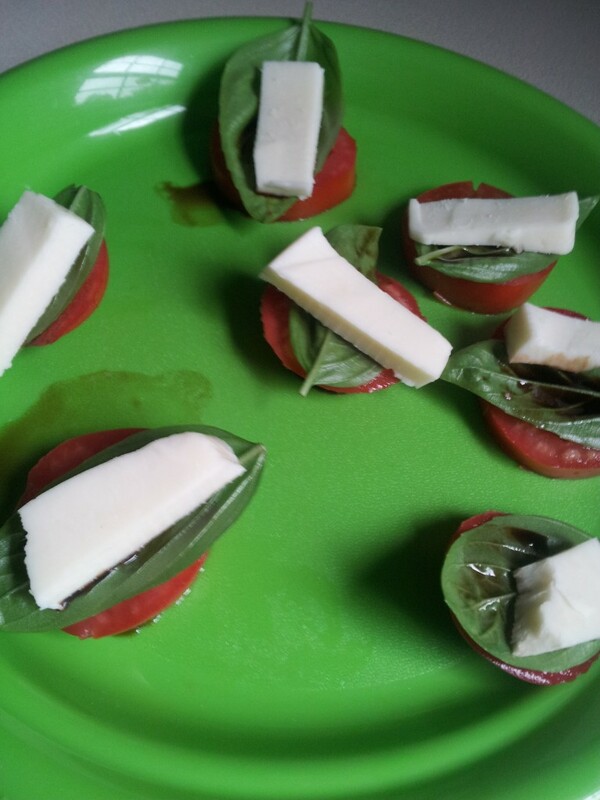 What other tomato-basil combinations make your mouth start a-watering and your belly start a-craving? Leave a comment below! 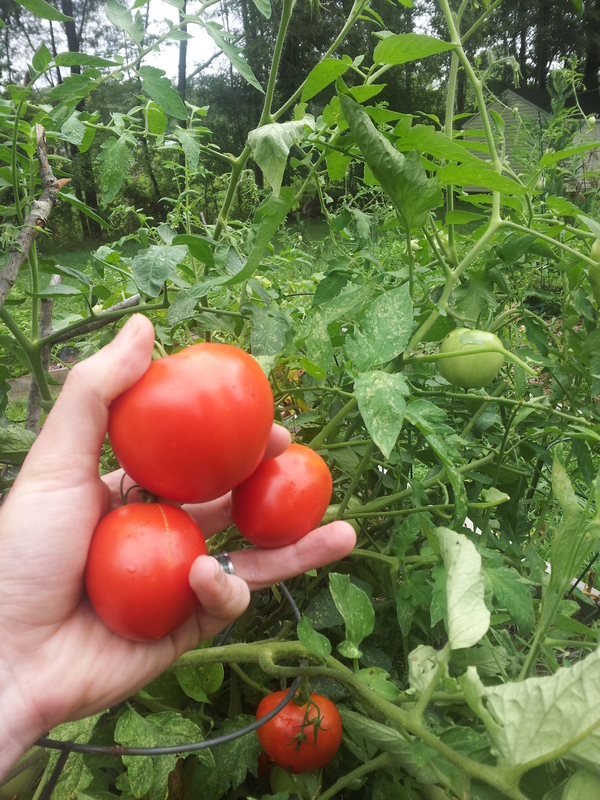 Posted in food, gardening, green living, health, organic	on Saturday, August 2nd, 2014 at 4:32 PM. For it to be bruschetta, I do believe you have to put it onto lil pieces of toast–but, hey, that's how language grows and changes, right? But the toast IS a nice carbo addition. 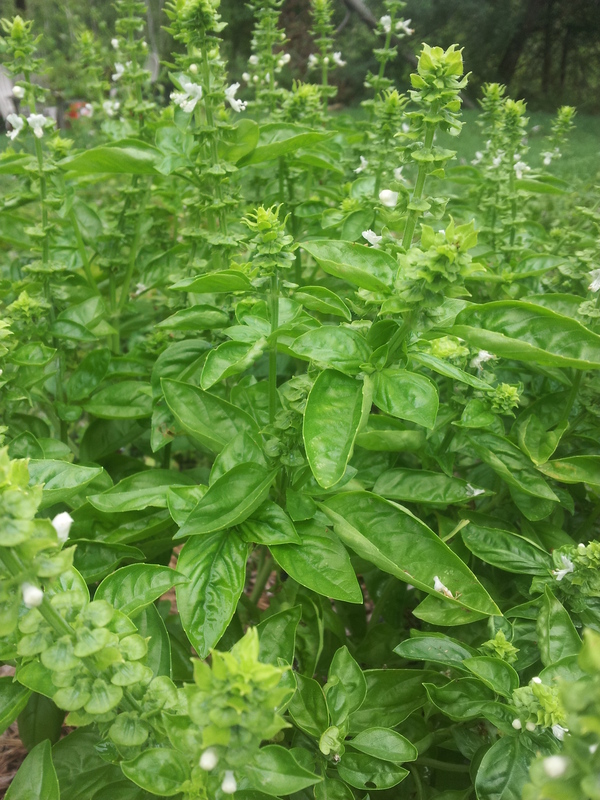 **You-all can use the basil-buds, too, you know–don't toss them onto the compost pile! Just grind them up into pesto, along with the rest of the stuff. OK: Pesto Recipe. No need to measure, really–just eyeball it as you go along. 1. Grind up (however: food processor, two stones, whatever) the basil that you have. 2. Add olive oil (ok, a measurement approximation: 1 c. leaves to about 3 or 4 tbsp.oil), a clove of garlic, about 2 or 3 tbsp. of nuts (pinenuts are nice, but expensive; sunflower seeds, or walnuts, are, I think, pretty much just as good). Grind all this up. 3. Add some grated parmesan cheese (about 1/2 cup or so). 5. Put the pesto on the hot pasta. Dale… I knew that all along, but in my heart, it felt right to call it bruschetta. A man's gotta follow his heart, ya dig? That basil pesto recipe sounds muy delicioso, I have to admit. A great way to use up some basil while making a great meal! Wow good recipe, This recipe is very useful. I use this recipe for making tomato sauce. When i have make chapati that time i make this sauce for side dish. Because i like tomato's very much. It is give delicious taste. basil leaves are good for our health so weekly once you can make these type of healthy food for your family members.